2. Tub/ bucket of warm water with Epsom salt or bath salts, ose petals, honey, milk, olive or coconut oil. The first step in at home pedicure is to clear your nails with any nail polish coat. Dab some acetone free nail polish remover for which we recommend Sephora nail polish remover. Then use a nail clipper and cut your nails, make sure you don’t cut your nails deep. Finally decide on how you want your nails to be shaped- oval, square, and other types. Use a nail file or emery board and give a beautiful shape to your nails. Don’t use the nail file in the back and front motion, instead it is advised to shape them in one direction. Smooth the nail surface and nail edges with a buffer and push the cuticles back gently with a cuticle pusher. Tip: Never cut or file your nails after your shower or when they are wet, this will only damage your nails furthermore. After prepping up your nails, it is time to give some love to your feet. Fill your tub or bucket with warm water and add Epsom salts or bath salts. Epsom salts will soften your heels, distress the leg muscles and even work as an exfoliator. You can even go a step ahead and add essential oils – lavender essential oil, peppermint essential oi, rose petals, milk, honey and olive oil and soak your feet for about 20-25 minutes. While you are doing this you can apply cucumbers on your eyes and get a complete rest to your mind and body. Tip: if you don’t have Epsom salt or bath salts you can even add baking soda to the warm water. This is the main step of the pedicure, not only your feet will turn super soft but even be squeaky clean. Before you start scrubbing your heels, apply cuticle cream on your toenails and leave it for a about 5 minutes, we recommend – Sally Hansen Cuticle Massage Cream, Fabindia Olive Hand & Cuticle Cream or Vedic Line Cuticle & Nail Cream. Wipe off the cream with a cotton and scrub your nails with an old tooth-brush. Now take a pumice stone and gently rub your heels, back of your feet and everywhere where you find your skin is hard. You will notice the dead skin scraping off your feet. 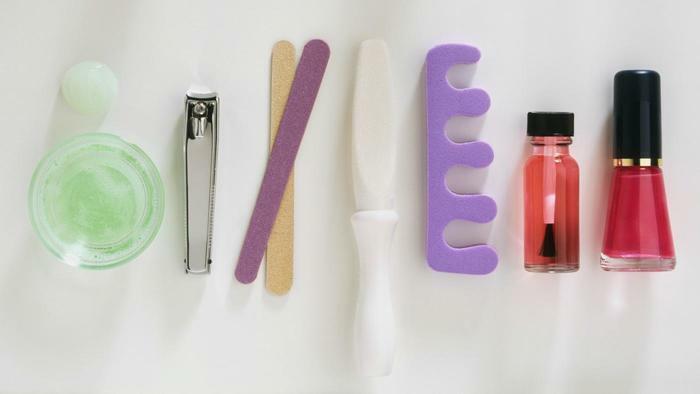 Then go back to your nails, wipe the cuticle cream and using a cuticle pusher push back the cuticles. Wash your legs and then exfoliate your legs with a good foot scrub like Avon Foot Works Scrub or check out our DIY scrub here. You can scrub your legs with a loofah or an old brush – make sure you scrub in between your toenails, heels, back of your foot. Then rinse off your feet with cool water. 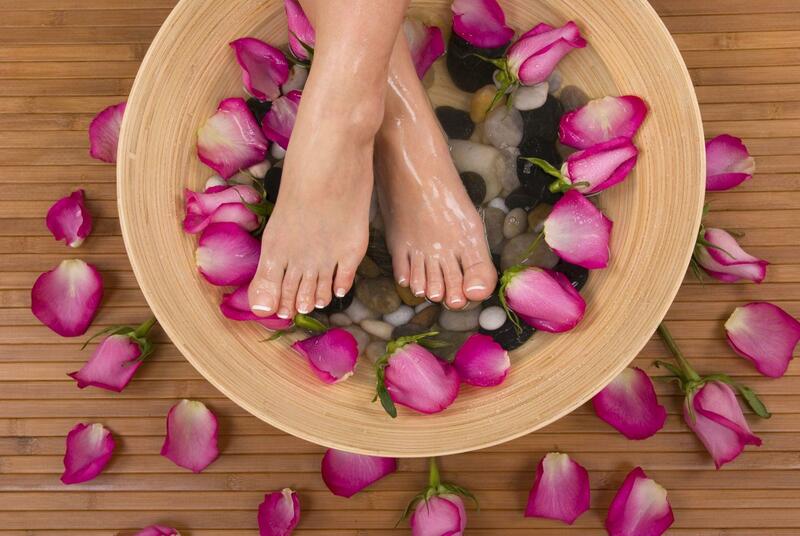 After soaking and scrubbing your feet, it is now time to massage your feet with a good massage cream or a foot oil. You can even use olive oil, coconut oil or any oil/massage cream you use on your face to massage your feet. Massage your feet for about 5-10 minutes with your fingers, this will stimulate blood circulation and nourish your skin. If you have a foot massaging tool then you are a lucky one, after massaging your feet, wash them with cold water and then dry them. Now use some foot cream, shea butter that will soften your skin, provide essential nutrients and prevent cracks. If you have cracked feet, use a special crack heel cream such as Patanjali Crack Heel Cream or a good ol’ Vaseline or even Vicks (which works pretty good for cracked heels)! If you want to end your pedicure here without finishing it off with a nail polish, then wear cotton socks to lock in moisture and to wake up to soft, smooth feet. BML recommends – Scholl foot and nail cream, Kama Ayurveda foot cream, Avon Foot Works Foot Cream. This is the best step in the at home pedicure. Apply a base coat and leave it to dry. Then choose your favorite shade and glam your nails with that shade. If you wish, you can even go creative with nail art. We hope this post helps you to pamper your feet in the perfect and easy way. Hi Arzoo, liked the post, especially the tips u added. Surely going to make a routine this winter. Want to know about cuticle cream purpose, any substitute? Hi Sonia, cuticle cream is designed specially for the cuticles, to prvent dryness and to keep your nails looking healthy & strong! 😊 nd thanks, but can i use anything else at home Plz, not able to go mkt. I”ll purchase later. Hi Sonia, yes you can use olive oil on your cuticles as an alternate to cuticle cream!